A cheesy, artichoke spread with a little zing! Love this recipe. You can't have a SuperBowl Party without these little grape flavored treats! Having company? This is a very fast simple recipe for a healthy appetizer. One of many sauces for dipping calamari. Russian Caviar Spread. Serve on thin sliced bread or crackers. Easy cheese ring recipe made with sharp cheddar and pecans with a little spice thrown in. Very simple herb and wine broth for little neck clams. Add some garlic and wow. I serve this with a hard crusty bread to dip in the broth. Easy stuffed mushroom appetizer. Crab and cheese stuffed mushrooms. Fresh diced tomatoes, garlic and fresh basil are tossed with olive oil and balsamic vinegar. Close you eyes, think of Italy. For a great Calamari Sauce click here. 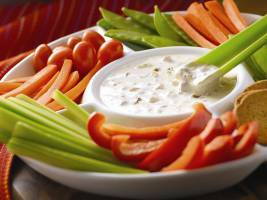 This is a great dip to serve with fresh vegetables. Even pickle spears taste great with this dip. "No need to pass on fabulous dips to maintain your diet," said Shield. "Thanks to the protein and fiber in chickpeas, hummus is light, yet heart-healthy enough to satisfy hungry sports fans. Try this easy recipe for happy game day guests." Appetizer recipe my mom makes. Spread it on crackers or vegetables. It does have a little bit which makes it VERY good. Lollipops - the rack is cut into individual chops and trimmed of all fat for an appetizer that is simple to make, impressive to present, and easy to eat right off the bones. If you don't count peeling the shrimp, this is a really nice and easy recipe. Mini Salmon Cake Appetizers Recipe. You can use Mussels Provencal as an appetizer or main dish. Have some crusty bread on hand to dip in the sauce. Serve over pasta for a main dish pasta meal. Celebrate this holiday season in style with a unique take on a classic appetizer. 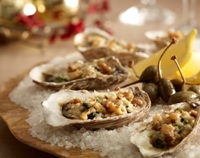 These savory oysters feature California walnuts and sambuca liqueur. Pimento Cheese has been called "Southern Caviar". The simple blend of cheese, mayonnaise and pimentos make for the quintessential southern comfort food. Pimento cheese sandwiches are a signature item at the Masters Golf Tournament. Pimento Cheese does not traditionally have parmesan cheese but it makes for a nice flavor. The are so many ways to make Pimento Cheese but this is a tried and true favorite. This is NOT the pimento cheese you find pre-packaged in the grocery store. Serve with crackers, celery, or as a sandwich. These pizza appetizers are always a hit at any party. Serve them with ranch dressing or marinara sauce for dipping. A textured spread of smooth goat cheese, parsley and California walnuts is paired perfectly with asparagus and red peppers, then carefully wrapped in prosciutto. A festive take on Japanese sushi, these bite-sized walnut sushi rolls wrapped in prosciutto are sure to impress your guests. Serve this dip hot with crackers or pita chips. I have to double it because I can eat the WHOLE thing. Salad Herring in Shuba Recipe. Make for a special appetizer. This popular Russian layer salad is made to look like a cake. 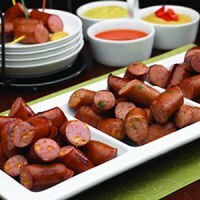 Smoked or Polish Sausage Appetizer recipe featuring the recipes for 5 different types of dipping sauces. These stylish hors d’oeuvres, infused with the crunchy goodness of California walnuts, are best made a day ahead to allow the cheesecake to chill before cutting into squares. 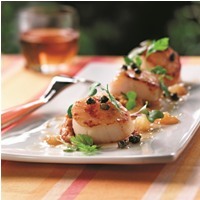 Top with your favorite ingredients to provide guests a variety of tastes and colors during the holiday season. My mom used to make this great shrimp dip for me and my friends. It's quick and easy. Now I make it for my kids and their friends. Smoked Salmon Mousse with Walnut Salsa Verde bites are perfect for entertaining and will make your guests’ palates tingle. A teaspoon of the walnut salsa verde adds a hit of tanginess to the rich flavours and creamy texture of the smoked salmon mousse. Recipe for Cork's delicious Steamed Mussels. Cork Neighborhood Bistro is a hidden gem in the village of Old North Charleston. 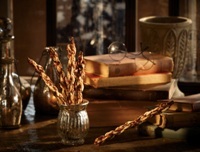 Poached pears combined with creamy Stilton cheese create a flavorful, mouth-watering addition to your holiday buffet. Stuffed Clam Recipe can be made for an starter or main dish. A cheesy flavor explosion, great for sporting event parties, or just as a treat for the Family! This can also be served as a side salad. A simple appetizer of jumbo prawns wrapped in a walnut coating, married with a sweet and savoury sauce, will delight seafood lovers. Mix a savory treat into your holiday baking assortment this year with these Walnut Lamb Empanadas. Take a traditional Latin American pastry and fill it with a combination of lamb, robust spices and walnuts. These will make for an impressive appetizer and a welcome addition to your dinner party. Mary's tasty littleneck clam recipe. The chorizo sausage adds a very nice touch. Delicious first course.